Background and Description: Grammy-winning flutist Rhonda Larson first came into recognition by winning first prize in the National Flute Association’s Young Artist Competition in 1985, resulting in a debut in Carnegie’s Recital Hall prior to her senior year of university. She was subsequently invited by Paul Winter to become a member of his renowned Paul Winter Consort, and spent many collaborative years together recording, producing, and performing world-wide. The association culminated in winning a Grammy Award for her work with that group. Shortly after her tenure with the Consort, Rhonda formed her five-member band Ventus. Ventus, Latin for “wind”, expresses the essence of Larson’s vision and approach to music: “like wind-trails across the sea, we follow uncategorical musical paths with inherent qualities of inspiration that celebrate the human spirit.” Like that wind, their music soars beyond industry labels and parameters, and merges the most soulful elements of sacred, Celtic, classical, folk, jazz and ethnic music derived from ancient folk sources, as well as original compositions by Rhonda Larson. 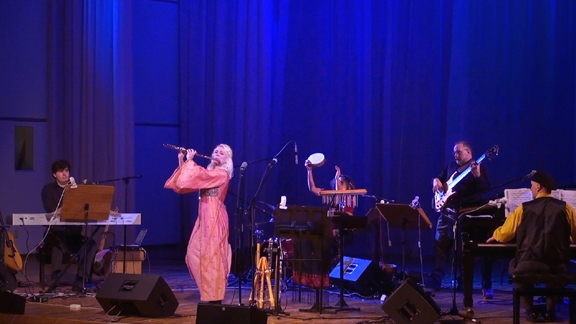 In addition to the familiar western European flute, Larson performs on an array of ethnic flutes and is joined by keyboards, acoustic guitar, bass, and a variety of hand percussion from around the world. Rhonda Larson & Ventus’ music has the precision and virtuosity of their individual classical training, and the accessible charisma of world music rhythms and melodies. 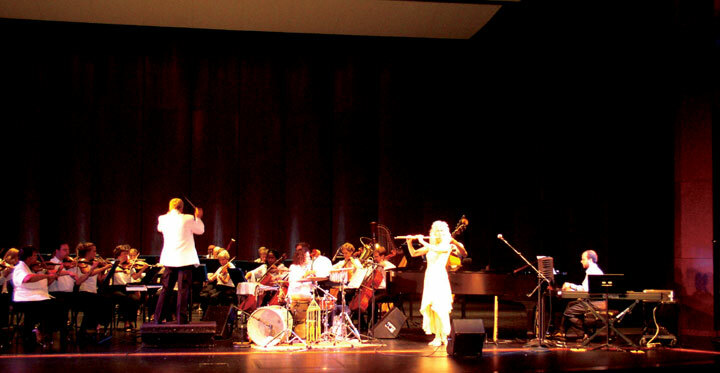 Their concerts take the audience on an international musical pilgrimage. They have performed world-wide, and frequently under the auspices of the US Embassy—a natural fit for Larson, given that her forte is the use of music as a diplomatic medium in addressing conditions of the human soul common to all peoples. For over 25 years, Ms. Larson has performed all over the world delighting her audiences with a style all her own. Born and raised in the mountains of the ‘Big Sky’ country of Montana, Rhonda was instilled with a nature-loving, trail-blazing ‘wild west’ spirit and a mountain-top perspective as to creative possibilities. 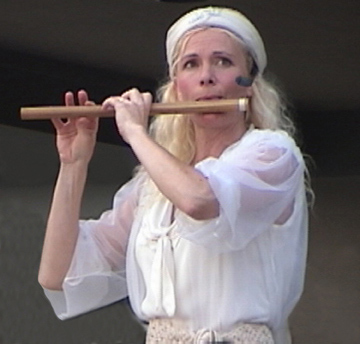 She is a ‘flutriloquist’, a term she uses to describe her remarkable ability to sing and play the flute simultaneously, as well as her unique illusory technical skill of playing both harmony and melody at the same time. 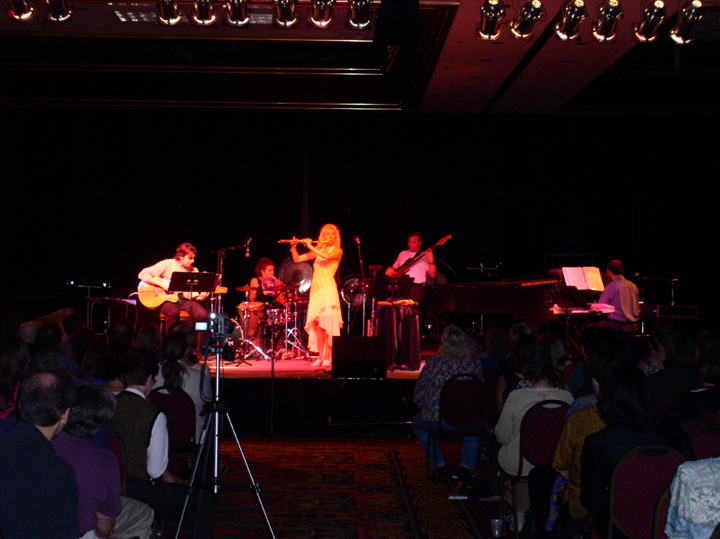 Rhonda is featured on more than 20 commercial recordings, including two solo releases, Free as a Bird, and Distant Mirrors. In the past two years, Rhonda Larson & Ventus have performed over fifty concerts throughout China, a country where for thousands of years the flute has been prevalent and adored. The Chinese do not think it ‘unusual’ for a Player of the Flute to lead a band and perform her distinctive variety of music, and she thanks them greatly for their perspicacious appreciation of her artistry. As well as full concerts with the trio, Rhonda Larson & Ventus appear as guest soloists with Symphony Orchestras on their Pops or Regular Subscription series. Over one hour of Larson’s music is fully orchestrated for this purpose. Besides her work with the Ventus trio, Rhonda also offers a one-woman show with her variety of flutes and diverse music. This is an intimate and uplifting performance, where she single-handedly takes the audience on an enchanting musical pilgrimage for the head and the heart.